Most local moves start with a moving quote which can be done online at www.movingconnections.com/moving-quote/ Remember a moving quote averages all types of household moves from long lived in stuffed homes to sparten student apartments. So, your real quote will be somewhere in between and will only be as good as the information you input. A great deal of detailed planning has to go into any successful move, and we at Moving Connections understand that. So we pledge to do our very best to ensure that your move is a seamless transition to your new location. Our team of dedicated local professional movers will work out the details of your move in advance so that there is no wasted time or effort when we arrive on site. And since Moving Connections is a full service moving company, we provide a wide range of ancillary services, such as home staging, handyman services, and storage areas, both climate controlled and conventional. We can even crate and ship items that require special handling or that you want to send separately. While Moving Connections will do their best to accommodate last minute moves, it's highly recommended to schedule your move as far in advance as possible. 1-3 weeks in advance is ideal in getting the day and time that you prefer, particularly when your move needs to occur towards the end/beginning of the month. So as soon as you have a firm moving date, call Moving Connections and get the gears moving so we can make your move a seamless transition to your new home. Moving Connections is a full service moving company, so we do more than just loading trucks. For instance, we can stage your home, assemble children’s playhouses, gazebos, elliptical machines, and trampolines, etc. 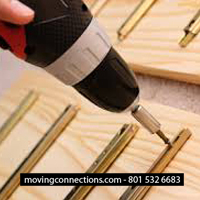 If you are renovating or just want to re-arrange heavy and bulky furniture, call Moving Connections Salt Lake City! Our professionals can also move specialty items like pianos, safes, and large furniture items. Let our professionals do the heavy lifting! Another service we offer is short term storage, including climate controlled units. One of the core values of Moving Connections Salt Lake City is their dedication to Senior Citizens which is to treat everyone the way you would want your grandma treated. We at Moving Connections understand how stressful this can be. Our staff is experienced at helping golden agers and will do everything they can to make this transition a positive experience for those who have given so much to us. Our staff handles senior moving with extra care and compassion, and our goal is to make this transition as stress-free as possible. As you look around your house preparing to move, you may feel extremely overwhelmed with the amount of items that need to be packed, wondering where to start. Well, you're in luck! At Moving Connections Salt Lake City, we specialize in packing services and so called 'Labor Only' moves. This means that you can rent a truck and drive it yourself to your new destination and unload your goods there. This is a great way to save money, as loading a truck requires skill and experience to do it right and safely. Unloading, however, is much easier and requires little skill to do it well. So if you feel so inclined, give us a call and ask about our “Labor Only” moving service and see if it’s right for you. No matter the size, our professionally trained movers are ready to tackle any job. Disassemble/Reassemble are included in our services for your convenience. However, many larger items can be fairly complex to disassemble and reassemble, which may add a substantial amount of time to move. These items can include complex bed frames or exercise equipment that won't fit through the doorway in one piece like larger treadmills and elliptical machines.